There are a lot of fun things youth can do and learn through Preble County 4-H. 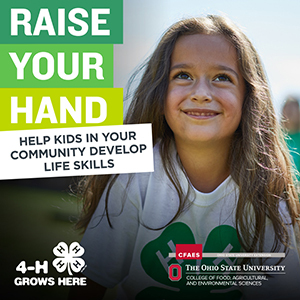 Youth can be in a 4-H club, attend 4-H camp or participate in other 4-H sponsored activities. 4-H is not just about animals and you do not have to live on a farm to be involved. You can learn about computers, cooking, art, gardening, environmental sciences and much more. 4-H helps members meet new friends and have new experiences. In Preble County 4-H, there are approximately 800 members with 175 adult volunteers who help with clubs. All 4-H programs focus on active involvement and quality experiences which help youth learn lifelong skills.